The health benefits of eucalyptus oil are well-known and wide-ranging, and its properties include being an anti-inflammatory, antispasmodic, decongestant, deodorant, antiseptic, antibacterial, stimulating, and other medicinal qualities. 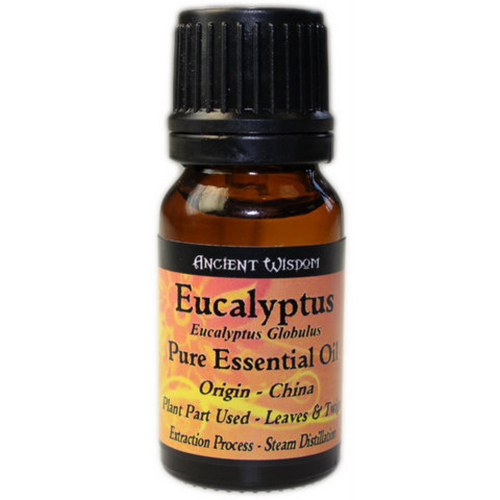 Eucalyptus essential oil is colorless and has a distinctive taste and odor. Though eucalyptus essential oil has most of the properties of a typical volatile oil, it’s not very popular as an aromatherapy oil because little was known about it until recent centuries, unlike the other ancient aromatherapy substances. The numerous health benefits of eucalyptus oil have attracted the attention of the entire world, and it has stimulated a great deal of exploration into its usage in aromatherapy as well as in conventional medicine. Eucalyptus essential oil is obtained from fresh leaves of the tall, evergreen eucalyptus tree. The tree, scientifically classified as Eucalyptus Globulus is also known as fever tree, blue gum tree or stringy bark tree, depending on where it is located in the world. Eucalyptus is native to Australia and has spread in the past few centuries to other parts of the world including India, Europe, and South Africa. Though many countries produce eucalyptus oil in small quantities, the prime source of eucalyptus oil for the world is still Australia. Due to the medicinal uses of eucalyptus oil and the compound eucalyptol which is present in its makeup, it is used in a variety of over the counter drugs including rubs, inhalers, liniments, rash creams, and mouthwashes. With so many properties that Eucalyptus has, its health benefits are worth knowing. Take a look at them in detail. Eucalyptus essential oil has antiseptic qualities because of its germicidal quality. Upon exposure to air, ozone is formed which is a well-researched antiseptic. Therefore, eucalyptus oil is used for healing wounds, ulcers, burns, cuts, abrasions, and sores. It is also an effective salve for insect bitesand stings. Furthermore, besides soothing the affected area, it also protects the open wound or irritated area from developing infections from microbial activity and exposure to air. Eucalyptus essential oil is effective for treating a number of respiratory problems including cold, cough, running nose, sore throat, asthma, nasal congestion, bronchitis, and sinusitis. Eucalyptus oil is antibacterial, antifungal, antimicrobial, antiviral, anti-inflammatory and decongestant in nature, which makes it a good ingredient in many medicines that treat respiratory problems. A study published in Laryngoscope in 2004 shows its usefulness in treating nonbacterial sinusitis. Patients suffering from nonbacterial sinusitis showed faster improvement when given the medicine containing eucalyptus oil. Gargles of eucalyptus oil mixed with warm water are consistently effective in treating sore throats. Asthma is a condition that affects millions of people around the world, and there are many known treatments for the condition. One of them is the use of eucalyptus essential oil. Simply massage 1-3 drops onto the chest and the soothing effect of the aroma and vapors will calm the throat and dilate the blood vessels, which will allow more oxygen into the lungs and normal breathing can be achieved. The anti-inflammatory properties of eucalyptus essential oil also come into play in using it to get relief from asthmatic symptoms. One very important reason that many people use eucalyptus oil is that it creates a cooling and refreshing effect. Normally, people suffering from certain conditions and disorders are slightly sluggish. Eucalyptus oil, a stimulant, removes exhaustion and mental sluggishness and rejuvenates the spirits of people feeling sick. It can also be effective in the treatment of stress and mental disorders. Apart from mental exhaustion, eucalyptus essential oil is commonly used to stimulate mental activity and increase blood flow to the brain. Since the essential oil is considered a vasodilator by many, it means that it increases the blood flow around the body by relaxing the blood vessels and allowing more blood to circulate. Basically, more blood to the brain means more brain power, and eucalyptus essential oil is commonly employed in classrooms as a form of causal aromatherapy to increase student performances. Further formal research must be done in this area, but all signs point to the positive correlation between brain function and eucalyptus essential oil. If you are experiencing joint and muscle pain, massaging eucalyptus oil on the surface of the skin helps to relieve stress and pain. The volatile eucalyptus oil is analgesic and anti-inflammatory in nature. Therefore it is often recommended to patients suffering from rheumatism, lumbago, sprained ligaments and tendons, stiff muscles, aches, fibrosis and even nerve pain. The oil should be massaged in a circular motion on the affected areas of the body. Eucalyptus essential oil is very effective against cavities, dental plaque, gingivitis and other dental infections owing to its germicidal properties. This is why eucalyptus essential oil is so commonly found as an active ingredient in mouthwash, toothpaste, and other dental hygiene products. Due to its well-known qualities as a bug repellent and natural pesticide, it is frequently used as a natural treatment for lice. Some of the mainstream treatments of lice can be very severe and cause damage to the hair, as well as packed with dangerous chemicals that you don’t want being absorbed into your skin, so combine a few drops of eucalyptus oil through a lice-infested head is a much better and healthier solution. Eucalyptus oil is a vermifuge and is frequently employed to remove germs in the intestine. Studies have shown that ingesting eucalyptus oil can deter many of the bacterial, microbial, and parasitic conditions that arise in the various parts of the body, particularly susceptible areas like the colon and intestine. Eucalyptus oil is often applied topically to treat skin infections and it helps speed up healing. When ingested, eucalyptus oil can help control blood sugar. Its properties as a vasodilator, mentioned above, mean that the entire body benefits from the increase in blood circulation. Diabetic patients commonly suffer from lack of good circulation, and it can be very dangerous, even resulting in amputation or death. Therefore, it is a good idea to frequently massage eucalyptus oil onto the skin topically, and also inhale it as a vapor to ease the constriction of blood vessels. For best results, massage it onto the skin after a shower. The vasodilating and relaxing qualities will benefit diabetics. Eucalyptus oil is also used for treating fever and reducing body temperature. This is why one of the common names of eucalyptus oil is “fever oil”. It works well when combined with peppermint oil and sprayed on the body as a mixture of a deodorant and a temperature reducer. Eucalyptus essential oil has plenty of antibacterial and antiseptic qualities, and when massaged onto the chest and used as a vapor rub or inhalant, it can relieve the signs and symptoms of harmful conditions like tuberculosis by clearing the lungs and reducing inflammation. It is best if applied to both, the chest and the back, over the area of the lungs. As mentioned above, this oil is a fundamental ingredient in many types of mouthwash and toothpaste. There have been a significant number of studies done on the antimicrobial qualities of essential oils. Eucalyptus essential oil has been shown to protect against microbial growth that can promote a host of different symptoms and diseases in the body. Many people add eucalyptus oil to baths, spas, and saunas because of its refreshing and antiseptic attributes. Most of the benefits of eucalyptus essential oil can be accessed through the vapor, as well as topical application or ingestion. Therefore, it is commonly used in aromatherapy, which is frequently included in spa treatment packages. There are many less-researched areas of application for eucalyptus oil, and they should be studied more before using them as completely effective treatments, but early testimonials seem to speak highly of its ability. It can be applied as a treatment for hayfever (seasonal allergy), acne, endometriosis, and herpes simplex virus. Usage of eucalyptus oil in aromatherapy is gradually growing in popularity because it blends well with many other essential oils including the essential oils of thyme, rosemary, marjoram, lavender, cedarwood, and frankincense. There are some dangers of taking too much eucalyptus oil because when taken in large quantities, eucalyptus oil can be toxic. It may also interfere with other homeopathic treatments. Also, for certain people with allergic sensitivities, eucalyptus essential oil might cause airborne contact dermatitis, which can be very uncomfortable, or even dangerous. Before beginning any new intensive alternative medical treatment, consult your doctor for advice, or have an allergy test done.